Oh no! Your vision is not able to differentiate between a light and bright color! You probably dropped out of high school simply because you didn't know what was expected of you. You were a sensitive kid with big ideas, a strong need for individuality, and the skills to interact effectively with others. Sometimes, it’s all you really need!! According to this color vision test, you were a decent high school student, more attached to your imagination than reality. You took interest in music and the arts, and considered yourself as defined by your internal compass. The idea of dropping out of society to get more in tune with yourself always made a lot of sense to you. You would try anything once, right? Your vision was able to distinguish between most of the bright and light colors!! This means you graduated from college, most likely with a distinction. You've always had good communication skills, a clear sense of your goal, and a positive attitude. You were flexible and organized, and knew exactly when and how to seek help. You showed strong commitment to complete your program of study. Way to go!! You are on top!! You didn't make a single mistake! Your vision is ON POINT!! You enjoy academic settings, as they fit your balanced, self-aware personality. You are engaged in the entire scholarly experience, and always seek opportunities to enhance learning. You are hardworking, and won’t let any challenge stop you from achieving the best grades possible. Good for you, Professor!! According to science, the way we see colors can determine alot about ourselves... including our level of education. 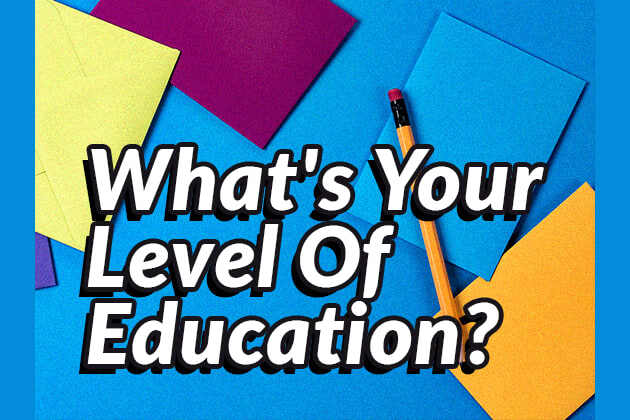 Take this test to determine what your level of education is!